Iranian parliamentary speaker Ali Larijani and Ayatollah Sadegh Larijani, the head of the judiciary, have responded in separate letters to the warning from Supreme Leader Ayatollah Khamenei, who had called for complete "obeisance" to his statements. 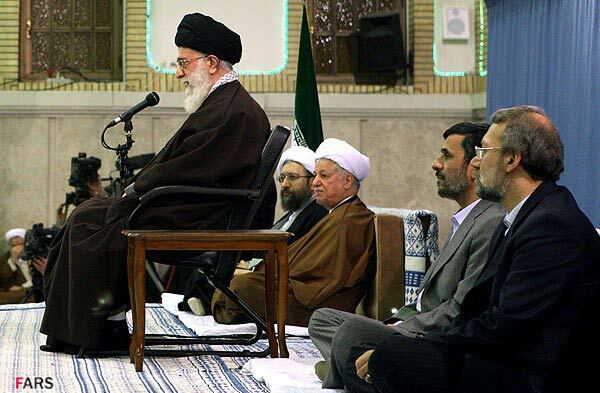 Supreme Leader Ayatollah Ali Khamenei at the front. Sitting int he back from left to right: Sadeq Larijani (Judiciary Chief), Akbar Hashemi Rafsanjani (Chairman of the Expediency Council), Mahmoud Ahmadinejad (President) and Ali Larijani (Parliament Speaker). Yesterday, Ayatollah Khamenei warned the heads of the three branches of government - President Mahmoud Ahmadinejad, Ali Larijani and Ayatollah Larijani - that they should avoid public disputes at all cost, stressing that any kind of action leading to divisions is akin to "treason." In their letters, the Larijani brothers express their high regard for the advice of Iran's Supreme Leader and make complete assurances that they will abide by his will. Ayatollah Khamenei stressed in his statements yesterday that it was vital that the country's senior politicians refrain from any political disputes in the lead-up to the June presidential election. Recently, President Mahmoud Ahmadinejad publicized his letter to Ayatollah Larijani demanding a visit to Evin Prison last week. Ayatollah Larijani responded by refusing the request and stressing that a visit to the prison while the president's press aide is serving a six-year sentence there could be politically misconstrued and was, therefore, not in the interests of the country. Ahmadinejad has not yet reacted to Ayatollah Khamenei's warning against public disputes.